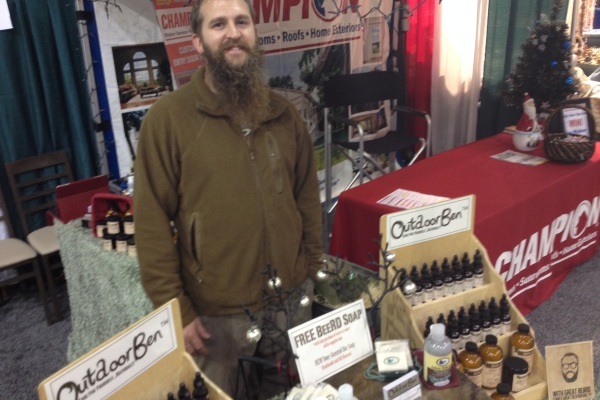 Today I’m highlighting a fellow local e-commerce entrepreneur, Ben Lawrence, who runs Outdoor Ben, a Indianapolis area maker of beard oils, handmade combs, bath salts, and body scrubs. Ben Lawrence came up with the name Outdoor Ben after the realization that he was unhappy in my professional life. It took him a long time to pinpoint the main reason for his unhappiness until he took a moment to reflect on his life. He determined early in life that he wanted to go into construction after visiting construction sites with a family friend. He was fascinated watching his friend manage crews and activities in muddy boots working outside. It was a far cry from the typical office position and that intrigued him. Ben went to Purdue and got a degree in Building Construction Management. He thought he was realizing his dream until he ended up behind a computer screen or a set of drawings, day after day…looking around at the same set of walls, day after day. It wasn’t exactly what he had in mind, but he never made the connection between his unhappiness and his career until he took a moment to reflect and realized that the problem was far simpler than he imagined. Ben was unhappy because he was always indoors. He found that he was much happier, much more energetic, and much more in his element when he is outdoors. It really is that simple. Ben just recently got started with the business after talking with his wife about their common interests. He wanted work to feel less like work and more like a part of his life. “People talk about a work/life balance. For me, going forward, it is not going to be so much about finding that balance as finding that union. I want my career goals to be in line with my personal goals. I want to make a difference in peoples’ lives, as does my wife. She helped me to realize this after she took similar steps in her life.” Ben’s wife’s background is in IT and website development, but after becoming allergic to basically everything she was ingesting (wheat/gluten, dairy, soy, yeast, antibiotics, etc. ), she was forced to change her lifestyle. She had to learn how to cook all over again. She had to read the ingredients in everything she picked up at the grocery store. When it was all said and done, these drastic changes resulted in her feeling better than she has ever felt in her life. 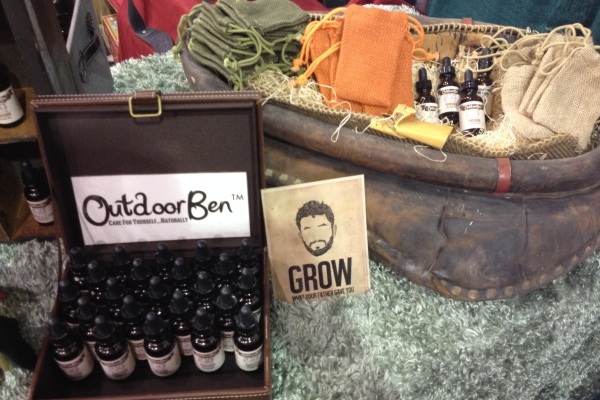 Outdoor Ben is concentrating on natural care products but eventually they want it to be more encompassing. They believe everyone has a right to know what they are putting in and on their bodies. They believe that people should know the basics behind growing their own produce and becoming more self-sufficient. They believe people should have preparedness plans in place and know how to react in a state of emergency. They believe that people should practice mindfulness to be fully connected physically and emotionally to their life and environment. So that is, in general, the grand vision of Outdoor Ben. For now, they are starting with beard oil and sugar scrubs, but they just want to offer people healthy alternatives to products they find on the shelves of the local store…free of harsh chemicals and toxins. It’s a start in the right direction. 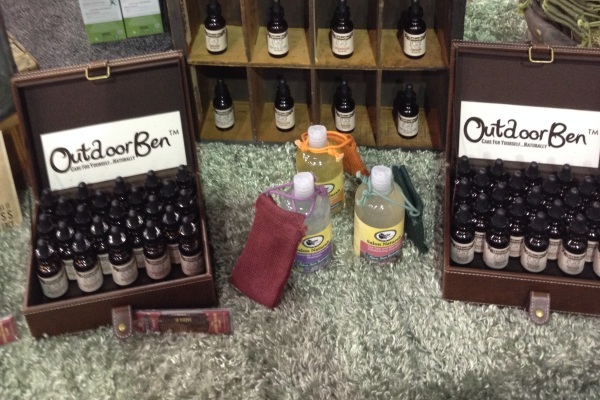 Ben develops and formulate the products using the highest quality carrier and essential oils that he can source. He sources organically as much as possible, and researches all of the ingredients to ensure their safety and therapeutic benefits. 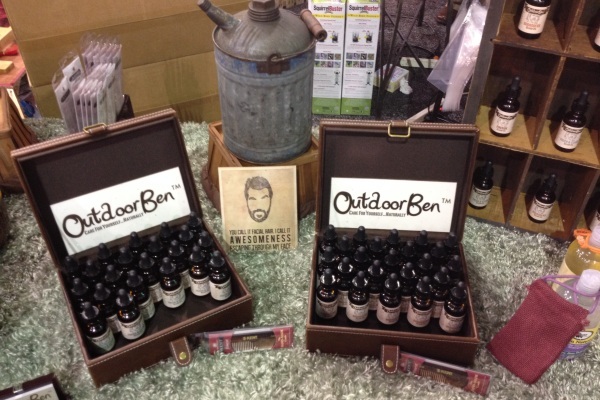 Their main product, beard oil, basically grew out of Ben’s desire to have a better looking beard. Ben has had a beard for about 5 years and stopped trimming it about a year and a half ago. It has grown out well, but it was very dry, crunchy, and hard to get a comb through. Ben noticed each day he was losing more and more hair from his beard to his comb. So Ben did some research and experimenting and put together scented beard oils using only carrier and essential oils that are known to moisturize and soften the skin and hair, naturally cleanse, and stimulate growth. He also sourced the highest quality hand-made, hand-sawn and hand-polished combs. Since each tooth of a Kent comb is saw-cut and polished by hand, your hair is not damaged and split – a usual result with use of cheaper, injection-molded combs.